A Landsharks Jimmy Buffett Tribute concert is fun! The Landsharks are great musicians but also put on a great show. After performing with The Landsharks Jimmy Buffett Tribute Band, Jimmy Buffett hired them, "on the spot", to be the house band at Margaritaville, and he called The Landsharks "Great Showmen,"and said "The Landsharks knew the songs better than I did." If you'd rather be going to "Margaritaville", for a "Cheesbuger In Paradise," then The Landsharks are the perfect band for you! The Landsharks will be playing your favorite Jimmy Buffett songs(and MORE)! The Landsharks perform regularely at The Margaritaville Cafes, and also, at The Margaritaville Hotels. The Landsharks are much more than just a Jimmy Buffett Tribute Band, in that the band can play a huge songlist of all styles of music from the 40s, 50s, 60s, 70s, 80s, 90s, 2000's, 2010's, 2018, and from all types and styles of music! Pictured Below: Gary Roland, of The Landsharks Jimmy Buffett Tribute Band, and Jimmy Buffett, performing at Margaritaville. 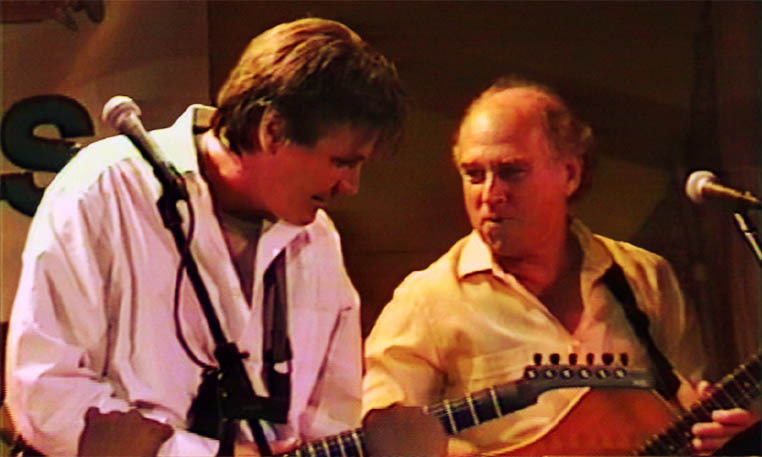 Pictured Below: Gary Roland and Jimmy Buffett, in between songs, while performing at Margaritaville! The Landsharks play at concerts, festivals, casinos, conventions, parties, weddings, private events, and more! Take a look at these great videos of The Landsharks Jimmy Buffett Tribute band performing with Jimmy Buffett, at Margaritaville! Are you afraid of having too much fun? Then watch out for The Landsharks! As one of the most well-known, well-liked and in-demand bands in the country, they have also performed throughout the world, at thousands of concerts and shows! The Landsharks have appeared with Jimmy Buffett in Key West, Florida and also at Margaritaville. The Landsharks performed at the Super Bowl victory party for The New England Patriots! Also, The band was selected from hundreds of bands to open up for the Beach Boys at the First Flight Centennial Celebration in Kitty Hawk, N.C. The event was hosted by celebrity John Travolta and attended by the President Of The United States. The Landsharks had the honor of entertaining our Service Persons, all over the World, as far away as Japan. 2,3,4,5,6,,7,8,9,10,11,12,13,14 or 15 piece band available! 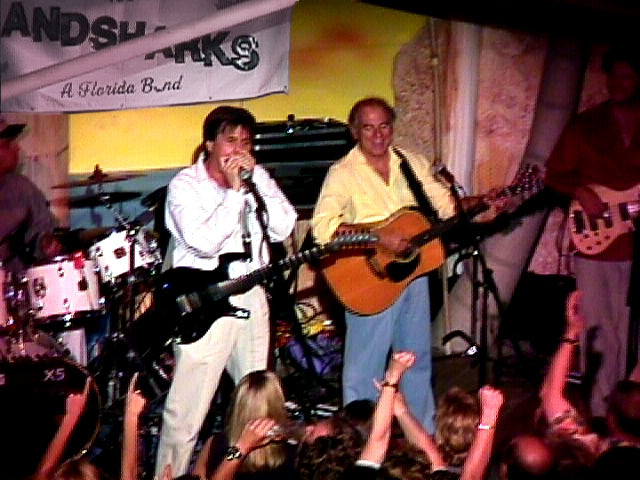 Pictured Below: The Landsharks and Jimmy Buffett, performing in concert, in Key West, Florida! So…what are The Landsharks? ........They are a fun, professional, interactive band with lots of audience participation and enjoyment! A "Landshark" is also anyone who is ready to have a good time! At a Landshark concert, everyone gets to see a great show, listen to great music and have an INCREDIBLE amount of fun! They play EVERYTHING and are guaranteed to have you singing along. This is most FUN you can have on land or water! Don’t believe it? Just ask Jimmy Buffett himself! 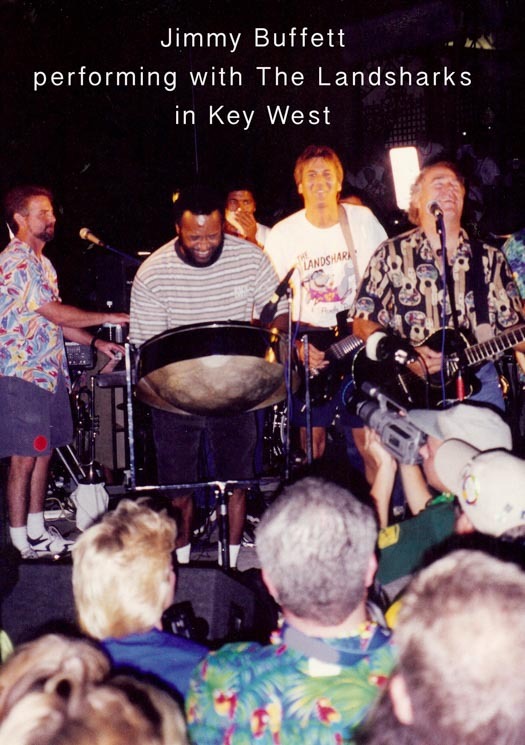 It all started when The Landsharks were performing in Key West, Florida for the "Parrotheads In Paradise National Convention", when Jimmy Buffett made a surprise appearance and performed right along with the Landsharks. He was so impressed with the band that he hired them "on the spot" to play regularly at his Margaritaville Cafe. The Landsharks continue to play at Margaritaville and you never know when Jimmy Buffett might just walk in and start playing with the "Sharks!" The Landsharks also played at The Jimmy Buffett Movie "Hoot'" wrap-party in Fort Lauderdale, Florida and also at Jimmy Buffett's Landshark Lager Grand Pre-concert VIP party at the Tallahassee, Florida Jimmy Buffett Concert. The Landsharks are on tour and will be performing at many concerts and shows all over the world. Watch out for one near you! The Landsharks Band is the only Jimmy Buffet Tribute Band to play with Jimmy Buffett in concert, in Key West, Florida, and at Margaritaville! The Landsharks are FUN! The Landsharks know how to work a crowd! .......Just ask Jimmy Buffett himself. 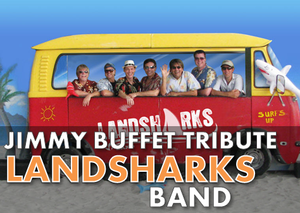 After playing with The Landsharks Band in concert in Key West, Florida, Buffet hired them "on the spot" to be the house band at Jimmy Buffett's Margaritaville Cafe at Universal Studios in Orlando, Florida. After later playing with The Landsharks at Margaritaville Orlando, Buffett, in a Radio Margaritaville interview, said that he'd had a lot of fun and that the Landsharks were great and "really knew how to put on a show". He added that up until playing with The Landsharks, he'd been afraid to allow bands to play his music at Margaritaville, but after playing with the Landsharks, he decided to allow it. He also later said on stage at Universal Studio's Margaritaville Cafe that when he'd played with the Band in Key West, "The Landsharks knew the songs better than I did!" Of course Jimmy Buffett has over 500 songs, so it's expected that every once in a while, he might flub a lyric or two....but you get the point. 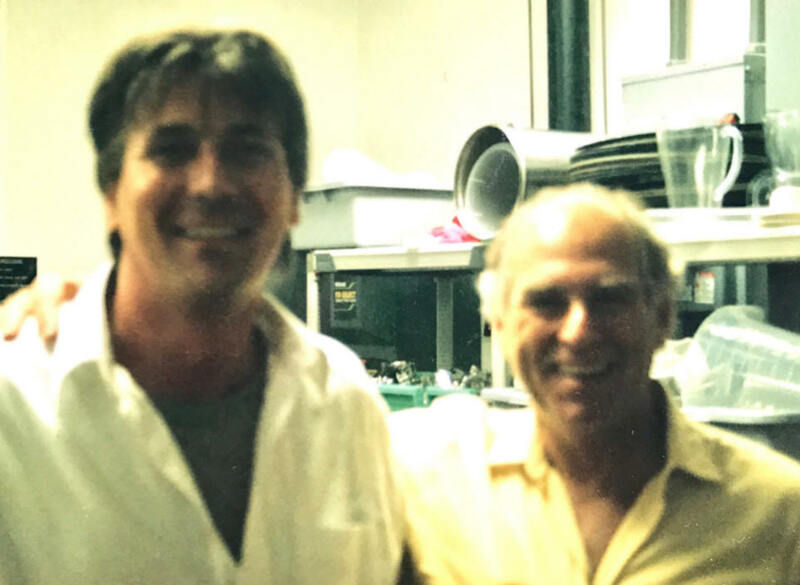 Pictured below: Jimmy Buffett and Gary Roland, of The Landsharks Band, backstage, after performing at Margaritaville! The Landsharks Band is a group of excellent musicians that work very hard to play the Jimmy Buffett songs to the highest level of excellence as possible. All The parts are there.....steel drums, horns, guitar, drums and percussion, bass , keyboards and piano, and vocals. And The Landsharks nail them!.....Exactly like the record and then some! In addition to playing "Landsharks Jimmy Buffett Tribute Shows" for many years, The Landsharks have also played at all types of other events including Concerts, Conventions, Fairs, Festivals, Weddings, and just about any other type of event for almost twenty years! And in addition to being able to play so many Jimmy Buffett songs, The Landsharks also have a HUGE SONGLIST of other songs and styles of music. The Landsharks can play songs from the 50's 60's. 70.s, 80's 90's, 2000, 2010, and today's hits, too. They play Rock, Top 40, dance music, and also Parrothead favorites such as Reggae, Calypso, Beach Music, Beach Boys, Tropical, Steel Drum music, Island music and more. The Landsharks playing EVERYTHING! One highlight of The Landsharks' career was being chosen from over two hundred bands (many of them were Jimmy Buffett tribute bands) to be opening act for the Beach Boys Band at The one hundred year anniversary of "First Flight Centennial" in Kitty Hawk, North Carolina, An major event that even The President Of The United States attended. The Landsharks have played at a Super Bowl Victory Party in Jacksonville, Florida, and have played at several other Super Bowl events, including a Super Bowl party, at The Super Bowl, for NBC Television! Just like Jimmy Buffett, being fun and entertaining, is easy for The Landsharks. In addition to playing most Buffett songs, they have an incredible songlist of so many different styles of music that they can play virtually any type of event. They have played concerts, corporate conventions, weddings, fairs, festivals, casinos, and just about any other type of event you can imagine, in just about every possible scenario there is. Every event is unique in its' own way. The Landsharks specialize in making the sound, the look, the wardrobe, the equipment, the interaction, the presentation, the timing, the song list, and every other element of the event is just right FOR YOU! The Landsharks often perform in Walt Disney World, Orlando, Florida and have played for a list of major corporations that has too many to mention. May of these doctors lawyers, etc. were Jimmy Buffett fans! To name just a few....Microsoft, AMGEN, SUNN Microsystems, Prudential, NBC, ABC, and for most of the major corporations in the world......the list goes on and on. The Landsharks were also the house band at Jimmy Buffett's Margaritaville, Universal Studios, Orlando Florida, for two years. But more importantly, the Landsharks will make your Jimmy Buffett Tribute Show FUN!. No matter what you ask of them, The Landsharks will make it fun! If your having a concert, festival, or fair and want a fun and interactive band that will really please the crowd, that's easy for The Landsharks! The Landsharks have traveled the country playing Jimmy Buffett songs as well as all other styles of music for years. If you prefer a quiet ambience and "atmosphere" at your event, the Landsharks are all excellent, trained life-long musicians that can play just about anything. The bottom line is that if you hire them, you get it all! You get top-notch musicians with vast experience that know how to entertain and also know how important your event is to you. They also know how to play your favorite Jimmy Buffett songs the way they should be played! Please take a look at the rest of the web page and feel free to email us or call us TOLL FREE at 1-866-426-6536. This Jimmy Buffett Tribute Band is one of the premier acts in the world! The Landsharks Band is the first and only Jimmy Buffett Tribute Band to perform with Jimmy Buffett in Key West and at Margaritaville, Orlando, Florida! Of all the other Jimmy Buffett Tribute Acts, Jimmy Buffett selected, the Landsharks Jimmy Buffett Tribute Band to perform at Bufett's new Movie, "Hoot." The Landsharks performed at the movie "Wrap Party" for Buffett and Movie Crew. The Landsharks Jimmy Buffett Tribute Band, performs their Jimmy Buffett Tribute Show all over the world and they are one of the Top Jimmy Buffett tribute bands! They have performed their Buffett tribute show at concerts, festivals, and even for Jimmy Buffett, himself at Margaritaville! Buffett praised the band after performing with them in Key West and at Margaritaville in Orlando, Florida! If you like Jimmy Buffett Cover bands, then you'll want to hear this Jimmy Buffett style band! Just ask Jimmy Buffett! On our Jimmy Buffett Tribute Bands page, you can actually hear Jimmy Buffett speaking about the Landsharks Jimmy Buffett Tribute Band! Over the years, Jimmy Buffett has gained a reputation for making "surprise" appearances all over the world. He often shows up in small, out of the way bars and sits in with the local band. Mr. Buffett has a large repertoire and often plays songs that he normally wouldn't play! The Landsharks are one of the world's most famous beach bands! The Landsharks Jimmy Buffett Tribute Band has played with, backed up, and opened up for Jimmy Buffett. 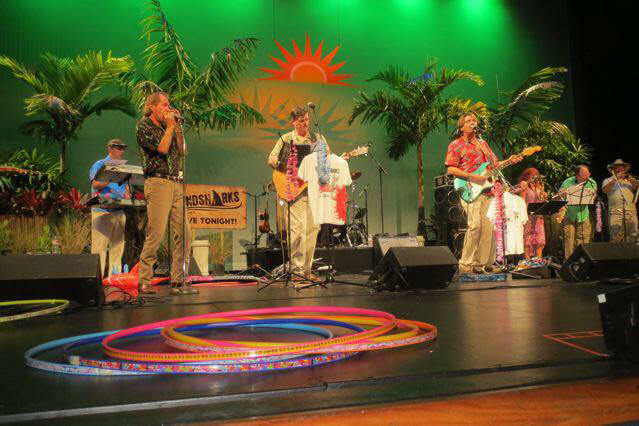 in concert, and at Margaritaville, The Landsharks Beach Boys Tribute Band has opened up for The Beach Boys, in concert! They've played at Super Bowl victory parties for The New England Patriots football team. They've played Disney World, ......at Universal Studios, .....at The NASCAR Coca Cola 600, .......and they've travelled overseas to play for the troops in Japan, Singapore, The Bahamas, and more! They've played at MANY concerts, conventions, festivals, parties, and other events, all around the world! The Landsharks Jimmy Buffett Tribute Show is a fun and interactive show that is very entertaining and really gets a crowd going. They are excellent musicians, who are also Entertainers. 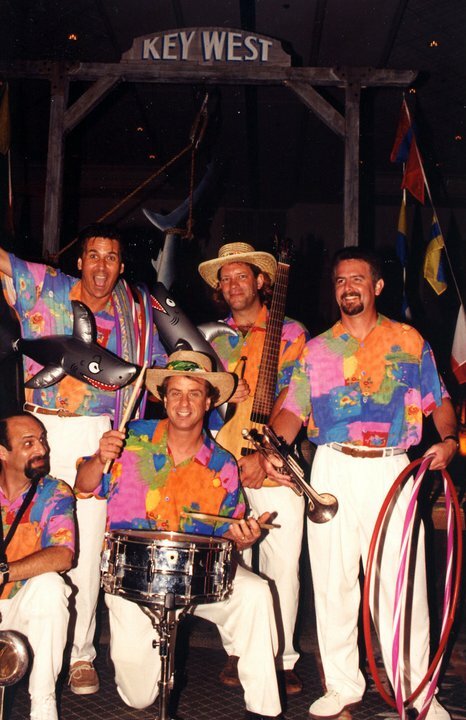 the Landsharks Band has performed with Jimmy Buffett in Key West, Florida, in Orlando, Florida, and at Margaritaville.